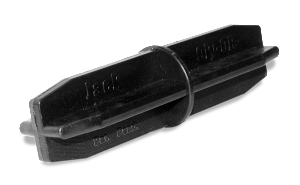 An alternative to Oly-Ola’s popular Black Edg-KnightTM style, Black JackTM is the industry’s best of the single 'v-lip' edgings. Without compromising quality, this edging was designed to be slightly smaller, making it a more economical option to help you win those close bids. 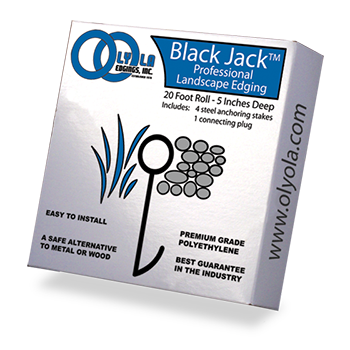 Black JackTM is also available in a boxed and rolled version which includes 4 non-bending steel stakes and 1 crosslock connector. 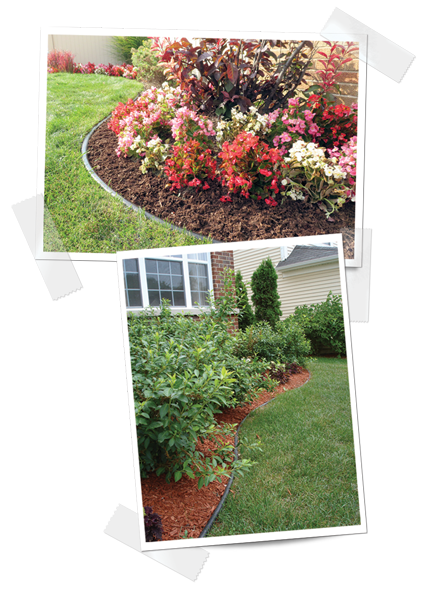 It is ideal for independent retail nursery and garden centers that want to carry a high quality, pre-packaged edging for their customers. 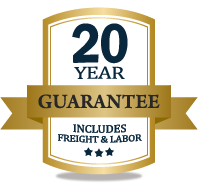 Black JackTM is made with 100% recycled, high grade polyethylene, without fillers or blown in materials. It is made to last! Dig a trench 5 inches deep along the lawn or bed edge. 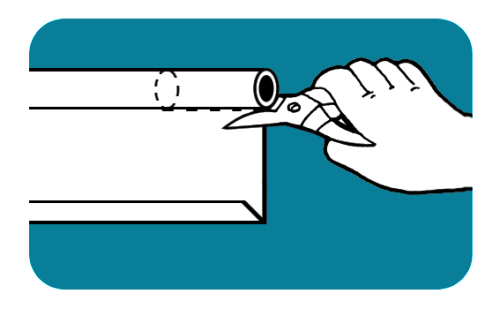 Place the edging in the trench and anchor it with stakes as indicated above. 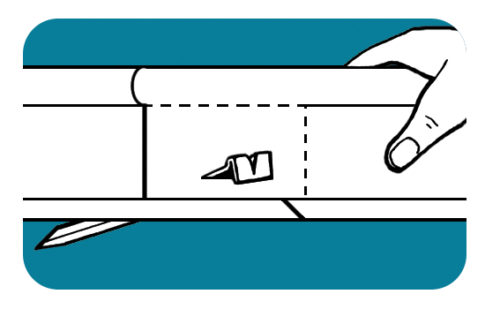 Use only Oly-Ola’s exclusive crosslock connector when joining two lengths of edging together and be sure to use the overlap method pictured below. Our unique crosslock connector is provided exclusively by Oly-Ola with all of our round top style edgings, except Trim-LineTM. The fit of this connector can be adjusted by rotating it. When looking at the connector’s end, it appears as a ‘+’. Inserted into the edging as a plus sign, this will give it a tighter fit. Rotate the plug 45 degrees and insert the plug as an ‘X’ and you will get a slightly looser fit. 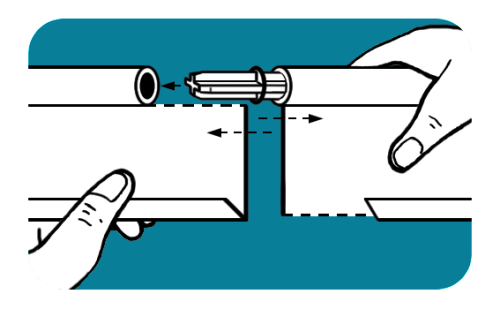 * Avoid weak and unsightly joints by using the overlap method (see below), and by using Oly-Ola’s tight fitting, effective connector. 1. Cut off a 4 inch section of the round bead on one of the edging pieces and a 4 inch section of the v-lip on the other piece with a metal snip, utility knife or saw. 2. Use our exclusive crosslock connector to join the two sections, while overlapping the two pieces of edging. 3. 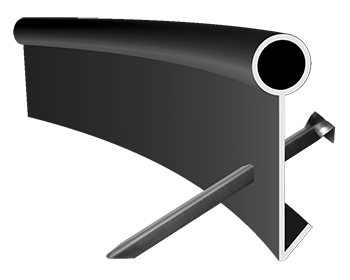 Drive 1 or 2 steel anchoring stakes through both sections at a 45 degree angle toward the turf or outside portion of the bed. Dimensions Per Piece: Length: 20 ft. 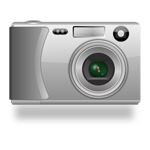 Height: 4.75 in. Dimensions Per Box: 23.25 in. X 23.5 in. X 6 in. Approx. Weight: 20 ft. piece: 5.6 lbs. 20 ft. bundle: 28 lbs. 10 ft. piece: 2.5 lbs. 10 ft. bundle: 12.5 lbs. Pack - 6 Rolls: 48 lbs. Skid - 32 Rolls: 294 lbs.